The Protea carrier board is a legacy product and not recommended for new designs. If you would like to use the second Ethernet port, you have to make a small Registry change. 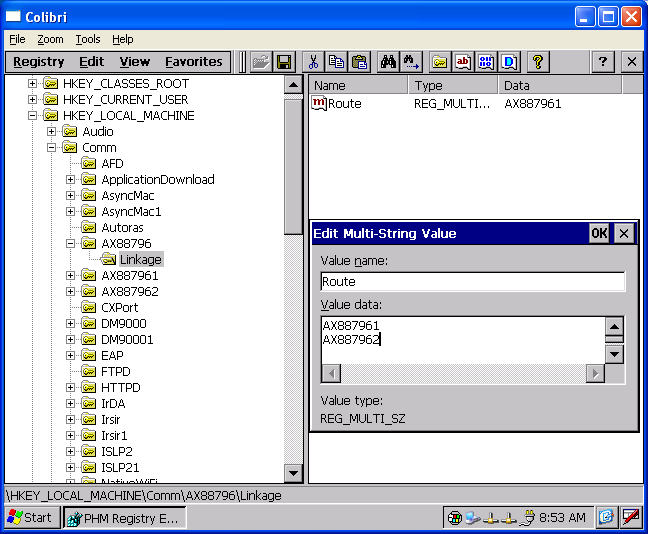 Add the String "AX887962" to the [HKLM\Comm\AX88796\Linkage\Route] key. After you have done the changes, do not forget to save the registry. The driver automatically sets a different MAC address for the second adapter. The first adapter gets the Toradex MAC + the Serial Number. The second adapter gets a MAC address 0x100000 higher. The RS485 implementation on the Protea board uses a Maxim MAX3089 transceiver connected to the BT UART. The RxD and TxD signals are used for communication. The RTS signal is connected to the driver enable pin DE directly. The CTS signal is used to switch between full and half duplex with the pin D.
The SODIMM GPIO controls the polarity of the receiver. The SODIMM GPIO controls the polarity of the transmitter. The SODIMM GPIO is connected to the SRL pin to choose between different slew rates. The CTS SODIMM pin must be set to 1 (3.3V) for half duplex. Receiver and transmitter normally need no inverter. Set SODIMM and SODIMM to 0 or set to input for no inverter. Set SODIMM to Input/High/Low to set the slew rate so that a maximum baud rate of 115/500/10000 kBaud can be reached.